When I made these cookies the first time I only made half the recipe and I didn't use high quality chocolate. Anxious as I was to try the legendary cookies, I resorted to Nestlé chocolate chunks. I have nothing against their chocolate chips it's just that when it comes to certain recipes, only the best should be used. This in one of those instances where a high quality dark chocolate will give you the best results. Trust me. The taste was 75% better than my first go-around. It was mid-December when I baked these, when cookie season was in high gear. I had some requests from friends for cookie exchanges (I will never pass up an opportunity to bake). Among all the festive 'holiday' themed cookies, I thought I would throw in some chocolate chip. I was hesitant at first because I thought people might be bored with c.c. cookies, especially when they were faced with platters of brightly decorated sugar cookies and almond crescents with their delicate coats of powdered sugar. Boy was I wrong. 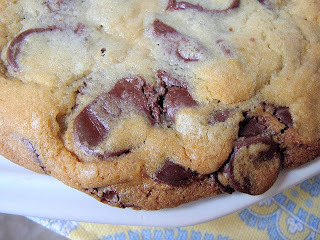 These monster-sized cookies literally flew off the plates, leaving their posh counterparts to weep into their crumbs. There were phone calls and e-mails demanding to know where I had bought these amazing cookies. Of course I had to straighten that out. I would never buy pre-made cookies not even for my frenemies (sorry, I hate that term too). But I think I converted several die hard Nestlé fans to the world of Jacques Torres. What makes these such powerful cookies is the large amount of chocolate. They are quite literally stuffed with massive amounts of it, finding a bite without a piece of chocolate would be difficult and a sad waste of time. I recommend making these as large as what the recipe states. Smaller versions will not do it any justice since the chocolate needs space to flex it's chocolateness. 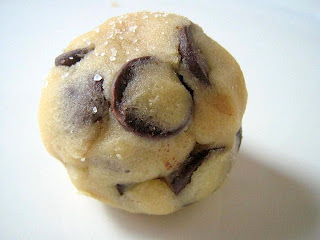 Please don't skip the pinch of sea salt on the cookie dough, this acts like a magnet drawing together all the flavours into one perfect union. And most important of all, refrigerate for 36+ hours. Yes, it's tough to wait that long. Just shove the bowl as far away from the door as possible and hide it with bread, milk, juice, anything that will help make you forget it's there. Or ease the pain by scooping out a piece now and then. Whatever it takes, no matter how difficult, just please chill it for at least 36 hours. I promise this will make a Huge difference. Also, you should know that this recipe is hand mixer friendly. Yes, it seriously bites that I don't have a Kitchenaid yet but my Cuisinart is a little powerhouse and she gets the job done. So, there are no excuses not to make these. Your wait, overheated mixer moter, and spoons that snap in half on the dense dough will be rewarded with a perfect c.c.cookie body. Sturdy, thick, chewy and unforgettable. Jacques Torres really is the king of chocolate - those look yummy! I've tried this recipe before but reading your post makes me want to try it again. The cookies I made were fine but they didn't stand out in any way. Now I'm thinking that my chocolate quality (Guittard) and shape (chips) were not high enough standard. I think I need to invest in some finer chocolate. Plus, I did not leave it in the fridge for 36 hours. I made the dough and baked them right away. 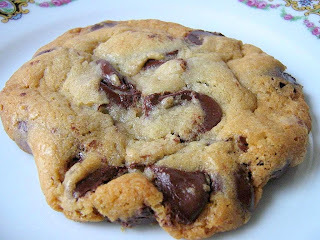 I'm always on the lookout for a fabulous chocolate chip cookie recipe. Always. Thanks for bringing my attention to this recipe again! Your cookies look so melty and yummy! Hi Heidi. 2 main components of these cookies are the refrigeration time and the chocolate (try to find some that are at least 60% cacao) I think Guittard makes an excellent bittersweet chocolate. For these cookies I used a mix of Scharffen Berger bittersweet chocolate bars and Ghirardelli’s bittersweet chocolate chips. Refrigerating causes the dough to 'dry' out a bit so when they are baked, the cookies will be sturdier. Also it draws out the flavours even more and gives the cookies a lovely caramel-like taste. I'll try them really soon ! They look fantastic !! 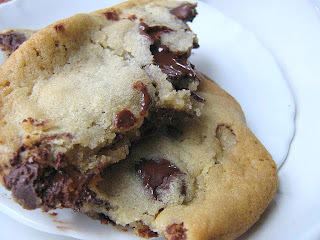 This is such a great recipe - it has ended my quest for the ultimate chocolate chip cookie. Dense, chewy, caramelly... perfect. My husband says they've ruined him for all other ccc's forever! People keep singing the praises of this recipe/technique, I really need to get on the ball and make these! Great post! I keep seeing these (and the NY Times recipe) around and I really, really need to make them. There is a huge difference in flavor between Nestle and high quality French or Belgian chocolate. I usually use Vahlrona but sometimes cheat and Ghirardelli 60% bittersweet cipc. After reading your experience, I definitely will go for the good stuff! I agree with you about the cc. Nestle products seem to be on the bottom of the barrel when it comes to taste. I've made JTCCC, and they're good, but not my fave. For a chocoholic, though, they are the best. Hi Leslie, Ghirardelli’s Bittersweet chocolate is fine to use for this recipe (half of the chocolate I used in mine was Ghirardelli). As long as it is at least 60% cacao. I was just going to tell you about Ghir. 60% chips, like Valerina did. Their chips are rather disk like and really good. And the JT/NYT ccc are my favorite go-to ccc! Yours look de-lish. Everytime I make them and give them away, people rave! Your chocolate cookies look wonderful!